I was very curious about the difference between Banana Bread and Banana Cake. 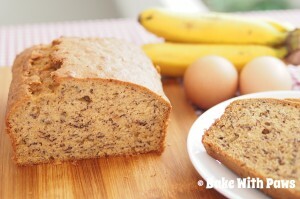 I Googled and found this - “Banana bread is a quick bread that is made in a loaf pan. It is dense and heavy in texture and very moist. 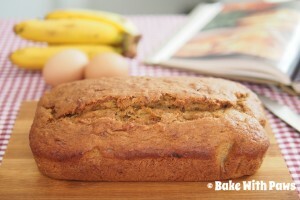 Banana Cake is lighter in texture but still is very moist with great banana flavor. Though they share similar ingredients, the amounts and mixing methods are different and make a big difference in the end product”. 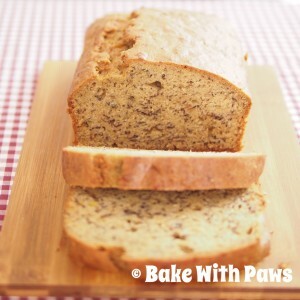 I had some ripe bananas in kitchen and was searching for banana bread recipes. Most of the recipes used a lot of sugar and butter. After studying them, I came up with this healthier banana bread recipe using less butter and sugar. 2. Line the bread pan with non stick baking paper. 3. Sift all the dried ingredients then set aside. 4. Cream the butter and sugar with stand mixer. 5. Slowly add in eggs, one at a time then add butter milk, vanilla extract and the bananas, beat until smooth. 6. Fold in the dried ingredients until well combined. Please do not over mixed. 7. Pour the batter into the lined bread pan. 8. Bake for 60 mins or until the toothpick comes out clean. 9. Remove the bread from pan and let it cool on the rack before serving. You may substitute buttermilk with fresh milk if you do not have buttermilk in your fridge. If you want to make your own buttermilk, please refer here for a Homemade Buttermilk Recipe.